Early in 2002 following a public meeting to discuss the closure of the community's only store and post office, the Exbourne Community Initiative Committee was formed. The original mandate of the organisation was to try and re-establish a shop - a community-run shop - possibly with additional facilities alongside it. The great importance of such activities in safeguarding the quality of village life was keenly recognised and the initiative was supported by the vast majority of local residents. The Temporary Shop set up in the village hall. 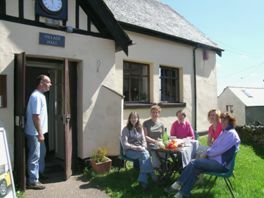 The Association quickly established a temporary shop, cafe and post office in Exbourne's Village Hall, opening 2 mornings a week and run (with the exception of the Post Office section) by volunteers. This facility has proved to be an extremely successful social enterprise. Opening soon extended to Wednesday afternoons also. Our shop has just grown and grown and with the support of local growers, plus a lot of hard work, we have managed to get together an exciting range of products, from fresh vegetables, canned food and even some hardware items. Each shop day we collect freshly baked bread from Endacotts in Okehampton. More people are now coming to us for their fresh produce and it's a delight to us when they stop for a coffee and a chat – so much nicer than the supermarkets ... and our prices are very competitive too! Fridays in particular have a special bustle as people stock up for the weekend. Many visit us on their way home from shopping in town, to show their support and because we have many items that they can't get elsewhere. There's always the chance too of something special grown locally. MMmmmmmmm! Bacon and egg butties freshly cooked with local products – give a good start to the morning. One of the most popular features of our current shop in the Village Hall is the café, where local residents and visitors can gather to swap stories and exchange gossip. Many people come to chat about their work, to show off their craftsmanship or discuss how best to grow a particular crop. We'll be doing the same things and much more in our new Underground Shop ... once it's completed. The Café performs a valuable service, giving many people the excuse they need to get out and chat. It's a place to go on rainy days, and it's a comfortable seat in between shopping from the delicious produce on show on nearby stalls. And on sunny days it can be even nicer if you sit outside! Whatever the reason to come, our Café has proved itself time and time again. Why not take a look for yourself? You never know who you're going to meet. The bank where the Burrow has now been dug. For practical reasons the shop has now outgrown its current location in the hall. The setting up and dismantling of temporary displays for the shop and café requires many hours of volunteer time and storage of goods is another problem. The association was constituted as an Industrial & Provident Society (IPS) on September 11th 2003 and worked towards a major project milestone - the establishment of a purpose-built facility in the centre of Exbourne village. An unusual feature of this project is the proposed underground setting which has captured both local and national attention. In April 2006, West Devon Borough Council granted full planning permission for the building and the project was set to enter a very exciting phase. By 2010 the project had raised over £185,000 following the receipt of two more grants; £15,000 from the Tudor Trust and £50,000 from the Greater Dartmoor Leaf. In autumn 2011 work on digging the underground shop begun. Plans for The Underground Shop – The Burrow!